AMC Conditions: Pinkham Notch Waterfalls: great hikes for rainy days! 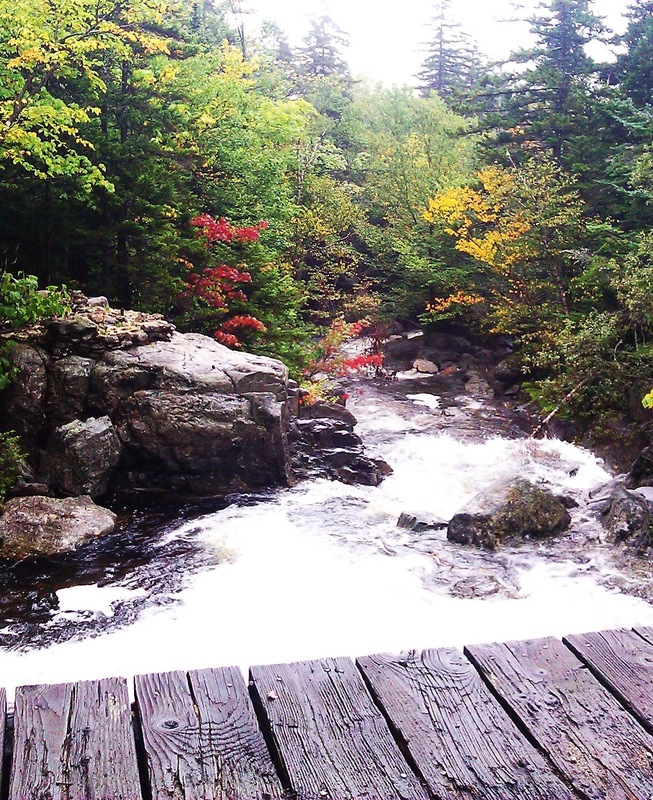 Pinkham Notch Waterfalls: great hikes for rainy days! With the recent rainy weather this week we have frequently recommended to our visitors to go visit some of the local waterfalls; lucky for us here in the White Mountains we also have some great waterfalls right down the road from the lodge. Crystal Cascades are an easy 0.4 mile hike from the AMC Pinkham Notch Visitors Center/Joe Dodge Lodge. 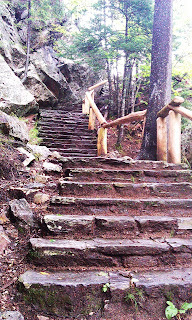 This is an ideal hike for families with young children. From the Visitors Center you follow the Tuckerman Ravine Trail crossing a bridge over the Cutler River, then up a slight hill you will reach a stone staircase leading to the view point of the Crystal Cascades, a beautiful volcanic vent. Along the trail you will see rocks that people frequently come back to the front desk and ask us the story about these incredibly distinct formations. 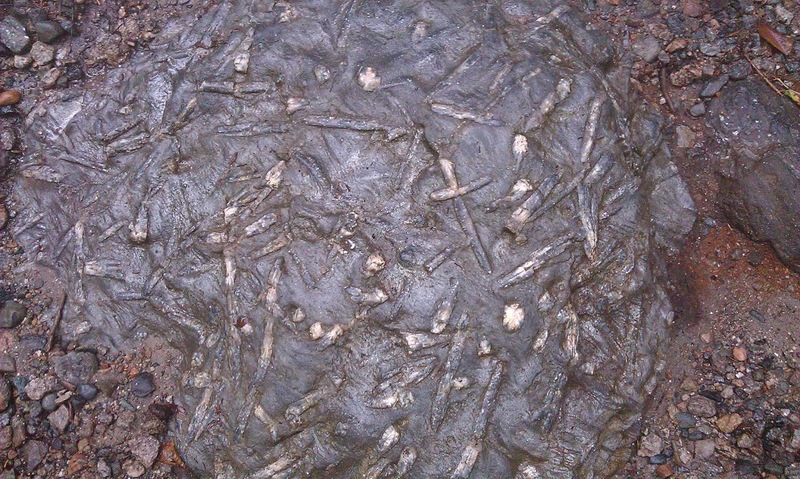 These formed due to many rounds of metamorphism; the heating of the earth with added pressure causes minerals to enlarge and sometimes also substitute other minerals due to multiple metamorphic events. 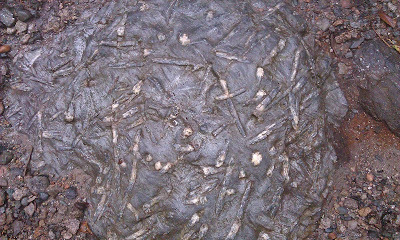 These are commonly called "turkey tracks" as you can see in the picture to the right. 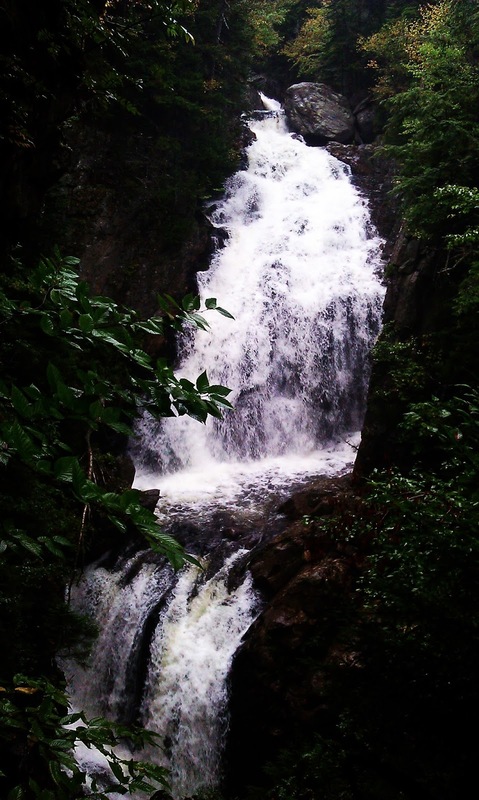 "Glen Ellis Falls. Height 64 FT. Here the forces of nature provide their own spectacular show. 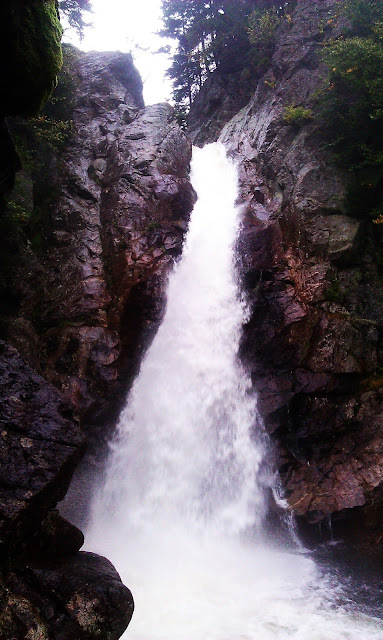 The fall of water attests to the tremendous powers of moving water. From the snow-covered or rain-drenched peaks this river is born to feed others. In the few seconds this message held your interest, a minimum of 600 gallons of water have passed this point. At this rate, the daily needs to a city of 25,000 people would be satisfied. 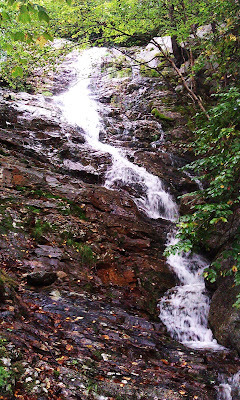 Water, indispensable to the needs of man, is one of the resources of the White Mountain National Forest." Headed back north to the Pinkham Notch Visitors Center on Route 16 you can also find the Pinkham Cascade about 0.2 miles north of the Glen Ellis Falls parking area on the left. The picture on the bottom left is the current conditions. On the bottom right is a picture from the conditions in February of this year! 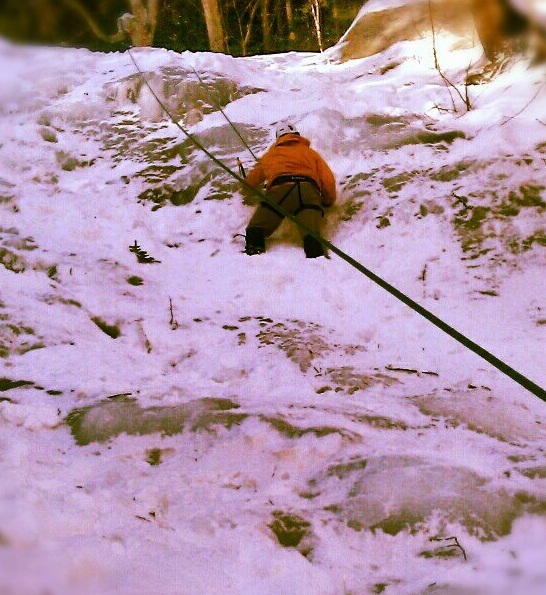 This is not a frequently climbed route in the winter, but a fantastic ice climb for beginners! Conditions for this upcoming weekend are looking good with a predicted mostly sunny forecast for Sunday, although bring extra socks and gaiters as trails will still be muddy with areas of puddles! 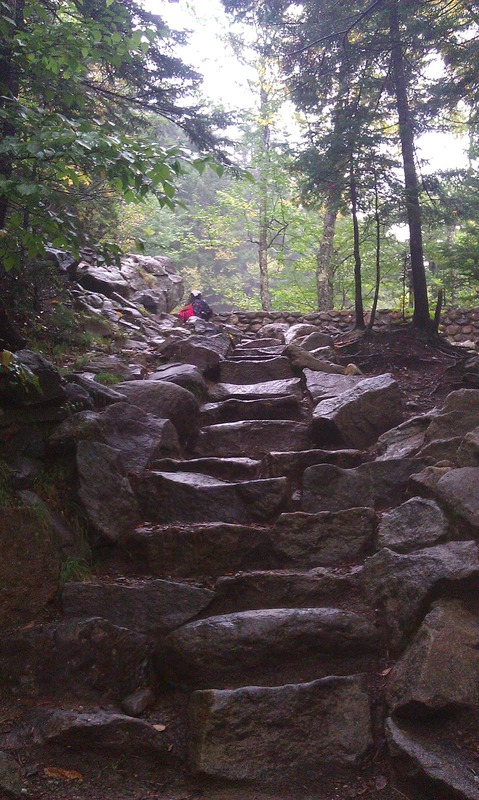 Stay tuned to our blog for recent trail conditions as well as updates on the foliage. Please check the Mount Washington Observatory Weather Forecast for up-to-date summit and valley forecasts.